A Responsible Path To Zero Waste: Boston’s recycling rate has risen from abysmal levels in recent years, but still lags behind the national average, not to mention top-notch programs in cities that have implemented best practices. Places like Seattle, Austin and even Chicago have been reaping the benefits of increased participation in recycling programs for years, while Boston still incinerates 80% of its residential waste, and pays tens of millions annually for the privilege. In addition, advocates have documented serious workplace safety and other labor problems in the recycling sector. Fixing all this will require a combination of political vision, thoughtful implementation and persistent organizing and engagement of all stakeholders. Clean Water Action co-coordinates the Boston Recycling Coalition (BRC), a partnership between community-based, worker rights and environmental groups, which has been organizing for dramatic improvements to Boston’s solid waste systems since 2010. Partnering with organizations like the Massachusetts Coalition for Occupational Safety and Health (MassCOSH) and the Boston Workers Alliance (BWA), Clean Water has created a campaign that much more fully represents the range of stakeholders in this sector, while aiming for Zero Waste. We envision a policy and implementation infrastructure that achieves 50% diversion by 2020, 75% by 2030 and Zero Waste (at least 90%) by 2040, in a way that maximizes benefits to all stakeholders. The predominantly Black and Latino members of MassCOSH and BWA have collaborated to build the newest member group of the BRC: a novel worker-owned cooperative business focused on recycling and organic waste processing called CERO (Spanish for ‘Zero,’ as in Zero Waste). The Global Alliance for Incinerator Alternatives (GAIA) and Toxics Action Center (TAC) round out our Coalition. Together, we have convened and staffed a Boston Zero Waste Task Force that represented many business, institutional, labor and other advocates, and released a set of policy recommendations for the City: a pathway to Zero Waste. The city ‘diversion rate’ refers to much more than just recycling, accounting for all materials removed from the stream of waste left over after consumption, including through re-use of items that are intact, recycling of trash by separating useful bits to sell as raw materials for new uses, and composting or other processing of food scraps and yard waste into useful products. While the residential diversion rate stands at around 20%, there is no firm commercial number since the City doesn’t manage or regulate waste from businesses or institutions. Observers estimate it at around 38%, and well over half the total volume of waste produced by the city- giving a rough total of around 30% diversion, compared to a national average of 34%. Seattle claims a 60% rate, Austin’s is well above 40% and San Francisco leads the pack at 80% diversion- though how each is measured can differ as compared to Boston. So what does Boston lack that these places have? A policy infrastructure that both incentivizes diversion and discourages trash, and a robust economic engine powered by this sector that provides more incentives for local communities to participate. In addition, it’s crucial to find ways of reducing waste in the first place. 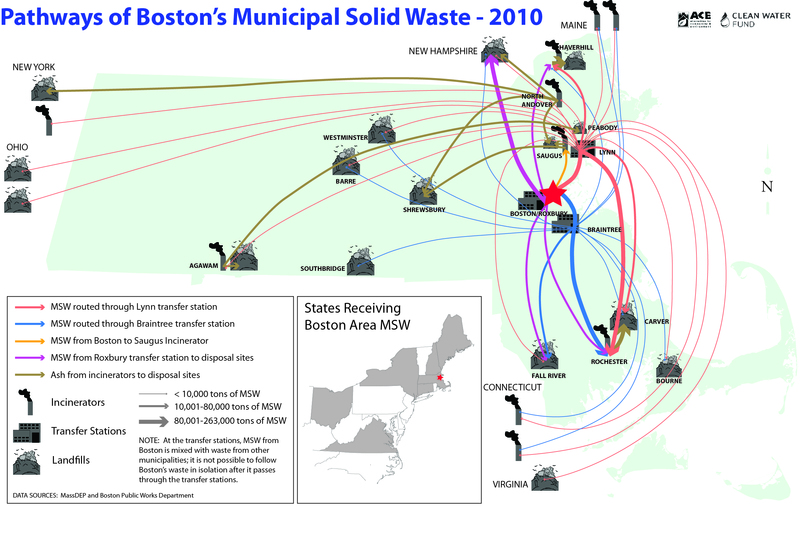 But no solid waste system is the same, and Boston’s landscape doesn’t allow for some of what’s in place elsewhere. That’s why Clean Water Action has joined forces with groups representing current recycling workers and lower-income communities of color that could benefit from improved rates, in a partnership to build the BRC. This kind of partnership makes sense on many levels, yet is rare in a world where all too often each constituency looks out only for its own interests. The BRC’s vision is of a strong city program that maximizes benefits, including reducing climate and other toxic emissions from incinerators and landfills, lower disposal costs and potential new revenue streams for the City, good local jobs for neighborhoods facing high unemployment, and innovative economic models that keep dollars in the local economy. This will get us well on the way to Zero Waste, where all or almost all materials left over after consumption become raw materials for new products and uses. Other cities around the world have begun to exploit the vast potential of Zero Waste, but Boston has the opportunity to score even more remarkable successes with a ZW Master Plan that takes workers’ and communities’ interests into account. In other cities, living wages and local hiring have been shown to be no barrier to industry health. Clean Water Action recognizes that engaging these constituencies is key to achieving environmental goals, and will continue working with the City to create a world-class solid waste system of which Boston can be proud. Read recommendations from the Zero Waste Task Force here. Image 1: Zero Waste Task Force members discuss recycling in Boston.